I’ve been working on my garden for a long time. When I had the driveway widened, I had bluestone gravel put down since I like the crunching sound of homecoming when I drive off the paved street into the driveway. I took the stones, which come up every time I sink a shovel into the garden, and used them to create the edging with the slight curves that welcome you onto the property and foreshadow the style which will be followed throughout the garden. Though I had professionals widen the driveway and initially place the stones I supplied, I moved them and moved them for quite awhile until I got the actual curves visually right. I moved the stone edging 6 times before I was satisfied with the curves. I did this instead of joining a gym. I planted spring bulbs and flowers, in order to give an early season, welcome to the folks driving by and the ones who walk by on their daily exercise circuit. I am pleased how the area filled in since my initial planting in 2001. In fact, it has filled in so fully that I’m able to divide and share the wealth with some other eager gardeners. I like the way the stones seem to have settled into their niches and look as though they’ve always lived where they are. The soil has slid through the gaps and the ground covers have leaped over the tops, naturalizing their display. This grand old oak tree was hollow and very much alive when I bought my property in 1989. It was a constant fascination to me that such a large tree could survive when so much of it’s trunk was hollow. This was years before I formally studied horticulture and learned about the xylem, cambium and phloem and their role in feeding the tree and keeping it alive. I just loved the strength and endurance of this massive tree for what I could see with my own eyes. It had the ability to live year after year with half of it’s core gone, pushing out leaves in spite of itself. To me it was a tribute to raw determination. A few years ago though, I noticed a decline in the top growth and I became concerned. This huge tree had always leaned quite heavily sideways and if it fell, though it wouldn’t land on any house or structure, it could fall onto the roadway and possibly injure folks driving off to do errands in their car. To avoid that possibility I called for a conference with my arborist, Eran Strauss of Tree Believers. We decided that the tree had indeed reached a tipping point and was now a danger. Eran and I had his crew cut the tree to a height of about 25 feet so that if it fell, it would remain on my property and fall into my woodland walks. Though I missed this living example of determination, I felt relieved that danger was averted. So one morning, weeks later, as I’m taking my first sip of coffee and looking out my kitchen window, something had dramatically changed in the garden. 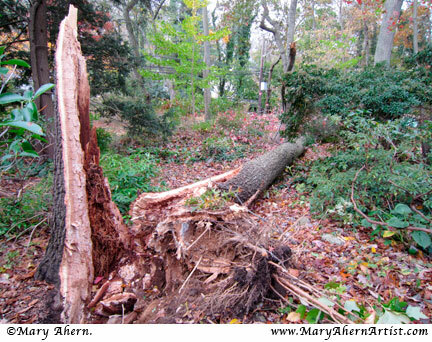 As I wandered out to examine the change I came upon the toppled top 15 feet or so of incredibly decayed pieces of oak tree trunk smashed to bits and strewn around the garden. The only damage was to my wire compost bins and not to any people. Our plan had worked. I now enjoy watching this remaining stump play host to birds and wildlife. The ivy and mushrooms love to snuggle into crevices. This old friend makes me smile each time I see it, remembering the strength and determination it had to live life on it’s own terms. And now it is resting and still giving back to the universe. I don’t have much seating around my woodland walks other than tree stumps since it is a place for a meandering journey rather than a destination. But I do have one bench that allows me to sit and take a break if my phone rings while I’m gardening. It also is very much a destination for my grandsons since they use it as a stopping and starting position for their many excursions with the dinosaurs and forest tigers they’ve found roaming the woods. This first bench I bought in 2000 to commemorate my graduation from Farmingdale State with a degree in Ornamental Horticulture. By the time this photo was taken in January of 2007, the bench was beginning to sink if you sat on it so it truly became merely a garden ornament. It surpassed my expectations in the quality of materials and the beauty of the design. I would certainly recommend the product and the company. I took this photo in April with one of my Rhododendron PJM’s in full bloom. A few years ago I transplanted this rhodi from another part of the garden and positioned it behind the bench to give a sense of enclosure. The view beyond is borrowed scenery since my property line is about 10 feet behind the bench. Here is a view from behind the bench looking towards my home. If you look closely you can see that I have secured the bench to the adjacent oak tree to prevent it from getting legs and walking out of the garden. Some years ago I found that my wood chipper had disappeared from the garden and it took me quite some time to get over the sense of violation and intrusion.